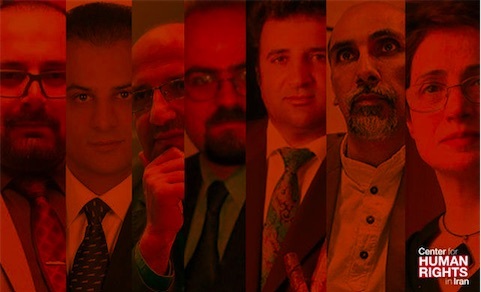 August 14, 2018—An intensifying state crackdown on human rights defenders in Iran, in which the authorities have denied attorneys the ability to represent their clients and jailed them for attempting to do so, violates Iran’s domestic laws and international obligations and must end, the Center for Human Rights in Iran (CHRI) said in a statement today. Iranian authorities have charged at least three human rights lawyers and blocked at least four others from retaining clients over the last eight months. “Iran is imprisoning lawyers for doing their job and depriving its citizens of one of the most basic human rights—the right to counsel of choice,” said CHRI’s executive director, Hadi Ghaemi. Nasrin Sotoudeh has been detained in Tehran’s Evin Prison since June 13, 2018, and is facing two national security charges for serving as the lawyer of a woman who was charged for removing her headscarf in public. Before her arrest, Sotoudeh had also strongly criticized the judiciary’s list of state-approved lawyers. Mohammad Najafi has been in and out of detention since being arrested on January 15, 2018. He is facing eight national security charges for telling media outlets that local authorities concealed the true cause of Vahid Heydari’s death in police custody during Iran’s December 2017/January 2018 protests. Iran’s judiciary has also blocked Najafi from retaining Payam Derafshan and Arash Keykhosravi as his lawyers; Najafi was told to pick a lawyer from a list of seven approved by the judiciary. Hossein Ahmadiniaz, the defense attorney in several cases involving basic rights in Iran, was summonedby Branch 4 of the Revolutionary Court in Sanandaj, the capital of Kurdistan Province on July 10, 2018, after he signed an open letter with 154 other lawyers criticizing Judiciary Chief Sadegh Larijani for restricting counsel for detainees held under national security-related charges. “What they want is someone who listens to them and won’t stand in their way. That’s a betrayal of the law. It will make lawyers more cautious and cause them to fear doing many things that could leave them off certain lists,” he added. “The UN and the international community should forcefully register their condemnation of these blatant violations of law and of Iran’s international obligations,” said Ghaemi. The International Covenant on Civil and Political Rights (ICCPR), which Iran is a signatory to, recognizes in Article 14, subsection (3)(d), the right of an accused in criminal proceedings to be represented by legal counsel of his or her choice. Article 35 states, “Both parties to a lawsuit have the right in all courts of law to select an attorney….” According to Article 48 of Iran’s Criminal Procedures Regulations, people have the right to ask for and have a meeting with a lawyer as soon as they are detained. The former UN Special Rapporteur for human rights in Iran noted in her March 2018 report her “regret” that despite the Bar Association’s call for a reconsideration of the restrictions on access to counsel in Iran, no changes had been made. The judiciary’s official list has not been released to the public, but opposition sites have reported that the state-approved lawyers include those known for advocating harsh sentences, including the death penalty, for detainees held on political charges. Many human rights lawyers have publicly criticized the list. In January 2018, 155 lawyers called on Iran’s Judiciary Chief Sadegh Larijani to stop restricting detainees’ access to legal counsel.